I fell in love with Campari in my twenties the first time I tasted a Campari and soda. Campari’s bright bitterness and brilliant red color paired perfectly with the sparkling water for a refreshing, visually appealing and relatively low alcohol aperitif. I’ve enjoyed Campari in a lot of different cocktails since then, but it has only been in the last few years that Kate and I have settled on the classic Negroni as our favorite. The Negroni has gotten a lot of press lately, with Imbibe Magazine promoting an international Negroni week this past June. Not bad for a cocktail that is probably at least a hundred years old. 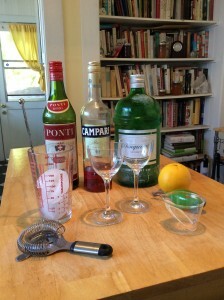 Originally one of the variations of a class of Campari based cocktails called Camparinetes, the folks at Campari renamed this predominate version the Negroni in the 1950s. The cocktail is purportedly named after Count Camillo Negroni, a Florentine nobleman, who was a devotee of the drink in the 1920s. With equal parts of gin, Campari and sweet vermouth, finished with a twist of orange, the Negroni is a serious aperitif that is packed with flavor. The botanicals from each of the component liquors mingle in the glass to create a complex harmony that is sweet at the front, herbaceous and fruity in the middle and bitter on the finish. It is simply fantastic as a pre-dinner cocktail, particularly if dinner is built around red meat or pasta. It actually makes me hungry just writing about it. You should also try two excellent variations of this basic formula: the Boulevardier, which substitutes bourbon for the gin resulting in a rounder cocktail which should be garnished with a brandied cherry; and the Americano, which leaves out the gin and adds soda water and ice. Built in a tall glass over ice, with a wedge of orange or lemon, the Americano has long been a favorite of mine for refreshment on a hot afternoon. Kate and I often make our own house variation of the Americano, which includes the gin, that we call a Negrano. 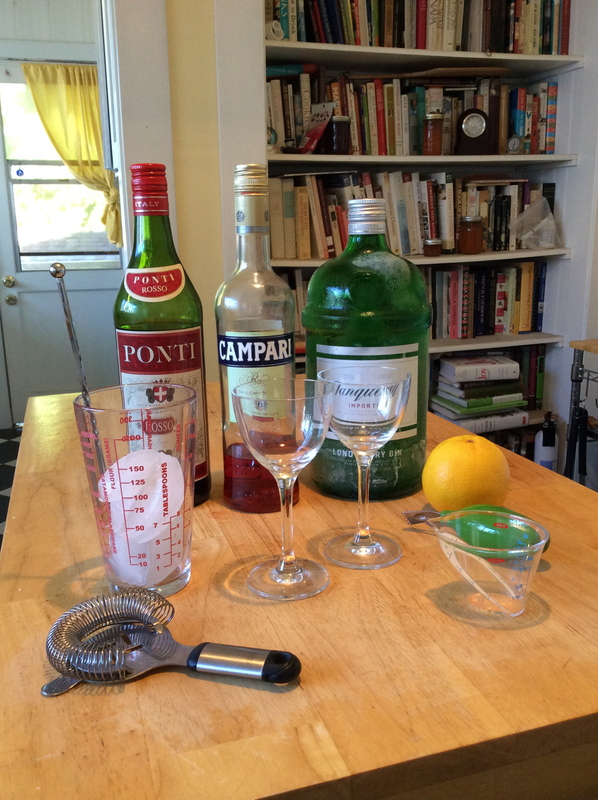 If you’d like to play along at home, we’ve shot this video of me mixing a Negroni. Stir with ice in a mixing glass until frosty and strain into a cocktail glass. Garnish with a twist of orange peel. The oils from the peel add a lovely orange note to the nose of the cocktail.